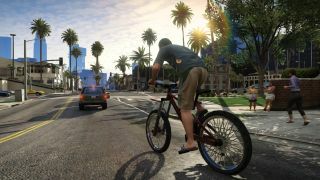 Amazon, which has a habit of outing games before they've been announced, might have just confirmed GTA 5's arrival on PC. The listings appeared on Amazon's French and German sites, the former of which has now been pulled. The German listing is still live here and has Windows 7 and Vista listed as compatible platforms. But it's not just Amazon dropping clues. A leaked bug log for the game makes over 170 references to a PC version of the game, with mentions of a PC version existing as far back as June 2012. PC Gamer pointed out that the log contains "PC development bugs, numerous notes on DX11 support and a related 'smog' weather setting." The leak actually appeared in an XML file back in September 23, and has been passed around GTA fans since. The list has recently put on a Google Drive server, which PC Gamer managed to grab some screenshots from before it was taken off. PC gamers have been calling for a port of the game since its release its release last September. As the clues suggest, we can expect the PC version to look pretty damn awesome. Expect some neat mods to be floating around too, should it ever see the light of day. There have been rumours that the PC will finally get GTA 5 in March this year, so Amazon's slip-up is timed perfectly. Now, how about getting it on Xbox One and PS4 as well? What's hidden away in those Blaine County mountains, anyway?